Did someone say Pacific Rim? 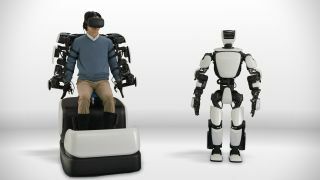 Toyota has created a humanoid robot that is controlled by directly mimicking the movements of a human sat in a seat called the Master Maneuvering System. Not only do you strap your arms into braces with sensors on every joint, giving you total control of the T-HR3’s arms, but you also have sensors on your feet allowing you to control walking forwards and sideways by lifting and placing your feet. Need to know where your robot is going? No problem, because a camera feed from the T-HR3’s face feeds directly into a VR headset that you’re wearing so you can ‘see’ as the robot sees. Space robots. Space. Robots. That you can potentially control from earth. We’re not over excited. You’re over excited. But seriously, having a robot like the T-HR3 that has independent motors for each individual joint in its arms and hands that can go into areas that humans can’t could save many lives. If you want to see how synchronized the movements are, check out the video from Toyota below. T-HR3 is the third generation humanoid robot, created by Toyota’s Partner Robot Division and while previous iterations have shown off their dexterity by playing musical instruments, it looks like this third generation could potentially have real-world applications. If you want to see the T-HR3 in real life, it’ll be featured at the International Robot Exhibition 2017 in Tokyo from November 29 through December 2.